Do you dare to be vulnerable? Do you dare to re-discover who you really are? Do you dare to enjoy your uniqueness together with others? Do you dare to be you? Come and explore yourself, your own identity, your patterns of behaviour and get rid of those that are not serving, creating space for your own freedom, to be who you want to be. Does it resonate with you? This ten-day international project might be open right for you. You may be looking forward a colorful varienty of experiential activites, light and deep, demanding and joyful. We are working based on “learning by doing” approach and combine elements of theatre, dance and body movement activites, circle sharing, non-violent communication, coaching and much more. 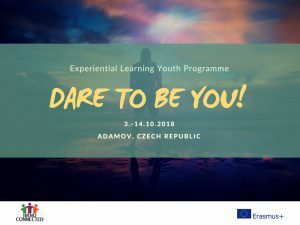 Together with a group of young people from seven countries, you will become part of a communicity that co-creates the content of our days together and supports each other in growth. You will have an opportunity to develop your creativity and imagination, leadership, communication and cooperation skills, planning and organising skills. Our aim is to create space for each of the participants to take up courage to dare to be themselves and to bring their authentic self into their everyday life.